Discussion in 'Crafts and Cooking' started by I'dLikeToBeATree, 16 January 2014. ...and then I realised I hadn't got any ears for TH so I made some quickly out of polymorph and hairclips >.>;; not exactly best quality, but hopefully they'll do! Teamidris, CrikeyoRilley, SmartyShy and 2 others like this. 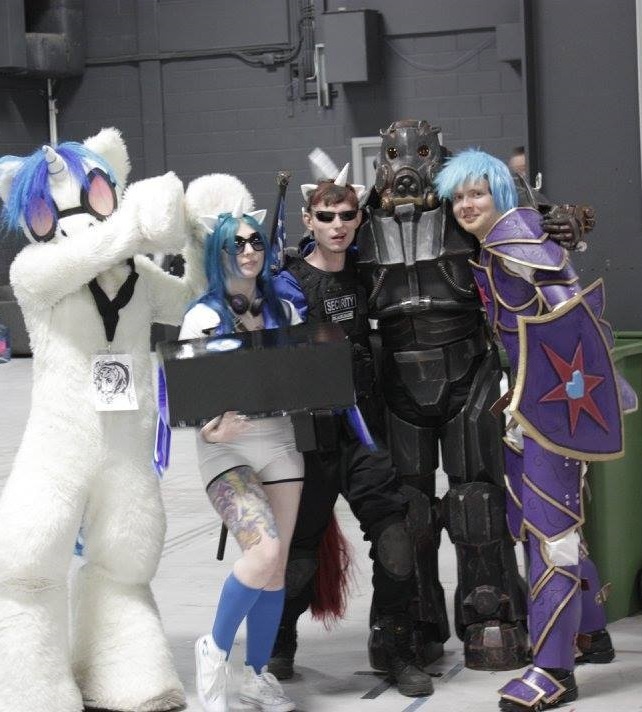 I've been lazy and so will be doing the same (first) cosplay that I wore at the last London comiccon- Rainbow Dash! I was gonna try and improve it, but, well, I've been busy :S Still, I really enjoyed cosplaying last time, so I'm looking forward to doing it again- and there's no reason to not wear the same costume more than once, right?! No pics from me haha, but I'll be one of the (no doubt many) male RDs milling around at BUCK Really looking forward to it! Really nice looking progress there, I'll keep an eye out for you on the day! I'm really interested in seeing how the Starlight looks altogether on the day, I'd initially planned to cosplay her myself (I think you helped me with wig finding via a Facebook group if I'm not mistaken! ), but I've had to shelf it because I haven't had the time to get it all ready. I'm actually being forced to do similar myself, I ran out of time after having been overrun with work and time devouring personal matters recently, so I'm falling back on Blackjack from Fallout Equestria again this time. I know there's nothing wrong with doing so, but I wish I didn't keep having to fall back on the same costumes time and again. At any rate I'm combining what I had last time with my Vault (Stable) Suit and working on the Pipboy (Buck) and vest for like the umpteenth time to get it ready for Blackjack. I got my Starlight Glimmer wig stuff through in the post today, even though I've called it off. I don't think just a finished wig and purple shirt are going to cut it for me, so I'll probably not bring it at all. I'dLikeToBeATree and StarStream like this. Here is my shining armour cosplay. (+ a hit girl) Spent around a month on it and it was my first time crafting armour. Finished it at 2am the day of MCM! So much stress - probably spend time tweaking it for october. vcgriffin, JammyMachiko, Max Apogee and 10 others like this. Seperate shoulder armour is neat. I might pilfer that concept. Did it stay up on its own okay? The seperate shoulders was competely accidental as i measured wrong (downside to not having a duct tape mannequin) but i went with it as it gave me a bit of play with the rest, more forgiving with mistakes. On hindsight, i would have worked with a thinner foam (mine was 12mm) and would have made all the pieces detachable (the front, shoulders, thighs are all one piece). DerpyWhooves, Bridle Timeout and CrikeyoRilley like this. So i am now allowed to post up what i built in around a few days ,idea came from what Knox's Workshop was building for Taylor birthday so i built this IF-9 shotgun from Fallout equestria's Velvet remedy main gun and birthday card to add which are both made completely free-handed. After getting a lift with knoxs we headed 200 miles down south to meet the rest of our friends and having a great night with everyone, but now i'm back home and in recovery mode. CrikeyoRilley, BronyMedic and Teamidris like this. 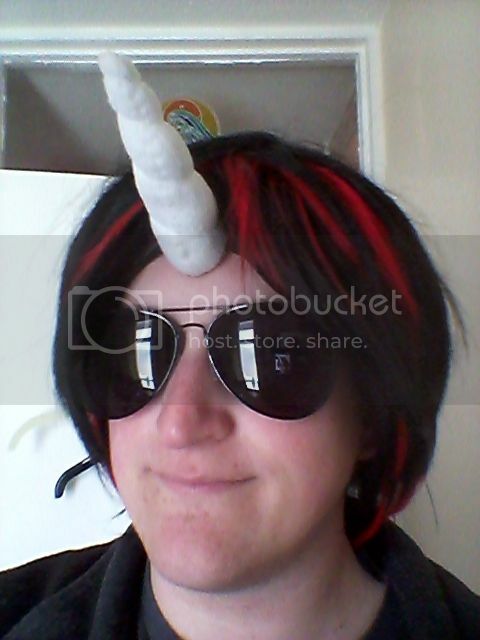 vcgriffin, I'dLikeToBeATree, Hampshire Brony and 5 others like this. *blows dust off thread* Guess what day is it, guys~? Thorn, Blaze_Midnight and DerpyWhooves like this. Well it isn't the first time I've seen a Sonata cosplayer. You really do nail her appearance quite well. I know I should've said this on your Facebook page when you first put the pics up online but like they say: "But late than never". I'dLikeToBeATree and ponePete like this. Starscream759 and DerpyWhooves like this. You did - very cute Love the taco photos! I'm going to post here (in the hopes that somepony can direct me elsewhere) but does anypony have any experience / guides to making a tail? I was thinking of getting a metal ring and looping sting (or sting type stuff round it) and then crimping it together at the top. Or you make a coil, tie up one end and cut the other end through its loop. Then comb out the strands. Or, twist out the string first with a drill. That's what I did, well kinda, and I know it didn't look 100% but I didn't think it looked that bad either (the wings were added on the way down, cant believe I forgot) Going to try and make a few tweeks for next time though.